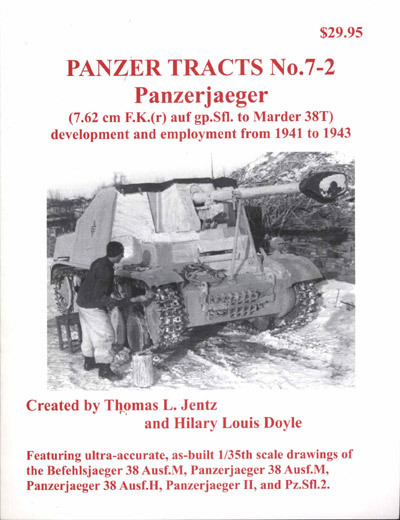 This is the second part of Panzer Tracts’ coverage of panzerjaegers and it covers all of the Marder types as well as the “Diana”, 7.62 F.K. (r) auf gp.Sfl. (SdKfz 6/3) with its captured Soviet gun mounted on a 5-tonne halftrack and used by the Afrika Korps. Only nine of these were built, and they get 5 pages before coverage of the Marders begins. 8 pages deal with the Panzerjaeger II fuer 7.62 cm Pak 36 (SdKfz 132) commonly know as the Marder II and then there are 17 pages on the Marder III with mid-mounted gun on Pz 38 (t) chassis. The 7.5 cm Sturmkanone on Pz 38(t) comes next on a single page, since there’s little information available about a prototype that never went into production. Then there’s the Marder I, 7.5 cm Pak 40 on Lorraine-Schlepper chassis in 10 pages, followed by the Marder II with 7.5 cm Pak 40 on Pz II chassis covered in 20 pages. Next are 15 pages on the Marder III Ausf H with mid-mounted Pak40 on Pz 38(t) chassis and the final vehicle is the Marder III Ausf M with its rear mounting of the same gun on the Pz 38(t) chassis, dealt with on 16 pages. All the vehicles that went into service are described with known unit allocations, a good bundle of experience reports – some of which are very detailed – and good clear photographs. Anyone building a Marder kit will find this book extremely useful, and even the Diana was produced by Azimut some years ago though you might have to search for that one. Only the Sturmkanone is not available, and conversion from a Pz 38(t) kit should be possible if anyone wants to try it.